wanderlust ATLANTA: "How to Use a Knife" is Top Notch! Any way you slice it, "How to Use a Knife" is top notch entertainment! Okay, okay...but you have to admit, the title begs for cleaver, I mean clever, wordplay. This brilliant, timely play is absolutely hilarious! It's also an exploration of the human condition. 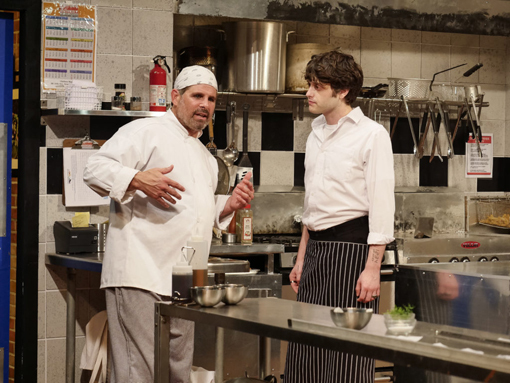 In the beginning—and for a great while—it pokes fun at some of the hilarity that happens in a typical restaurant kitchen (I know, I've been there. ), then it moves on to explore mentoring, friendship, compassion, disaster and more laughs, leaving you with "Wow! That was powerful...and funny!" This is the final week to see "How to Use a Knife" at Horizon Theatre, the closing night performance being Sunday, June 25! Executive Chef George (Brian Kurlander) comes in blazing! A recovering alcoholic/drug addict, this is his first job after sobering up. On the way to discovering what tragic circumstance sent him to such depths, you'll see George's influence on others' careers, his understanding and compassion, as well as his remorseless dislike of bull*hit. Steve (LaParee Young) transitions from a hardworking and mysterious dishwasher to a heartbroken and resolute patriot he's been for most of his life. You don't see it coming, because he hides the atrocities of his past so well, but you're going to feel it when it hits. Brian and LaParee are superb, accomplished actors. With an amazing supporting cast, they're the stars of this dark-comedy political-thriller that gifts bushels of laughs and so much more. The set design and props are amazing! I was convinced that the dishwasher was a working dishwasher, but later learned that there's a "smoke" machine inside. It's one of the most convincing prop effects I've seen in ages...absolutely brilliant! 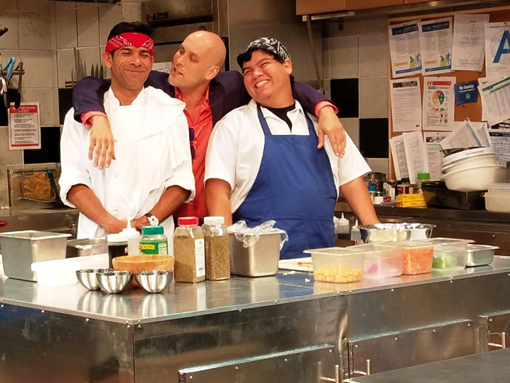 The line cooks will keep you laughing throughout your time in the kitchen, leaving your funny bone fully satisfied. Carlos (Tony Gurrero) is the character that had me laughing the most. Not only from what he was saying, but—and this takes great talent—from his expressions...you can read his face like a book and it's reading one joke after another and another and another. Listen to his lines as closely as you watch his expressions and give in to laughter. I had the pleasure of talking with Tony during the Opening Night reception after the show. He's super nice and incredibly busy! His acting experience is extensive and he has several projects coming to stage/screens very soon, including Atlanta-filmed Pitch Perfect 3. I was already impressed—and mesmerized—by his acting...and then I found out that he was in X-Men: First Class. I totally geeked-out! Miguel (Orlando Carbajal Rebollar) has some of the funniest lines in the show, but I didn't understand any of them! Nearly 100% of his lines are spoken in Spanish. I speak some Greek and know a little American Sign Language, but zero Spanish. Orlando's acting is so brilliant that you don't have to know the words to understand the hilarity he's spewing! Orlando also has, in addition to wonderful acting talent, a most remarkable operatic singing voice! This is not a musical, but the audience is treated to Orlando's singing on multiple occasions...delicious dessert for your ears! Restaurant Owner Michael (Brad Brinkley) is cocky, arrogant, sexist...he's one of those characters that you just hate. Of course, that tells you that Brad's acting is fantastic! Jack (Jeremiah Parker Hobbs) wants to be a writer, not a busboy. I've done both so I totally connected with this character. The 'waiter life' is fast and furious, sometimes not leaving much time to reflect and ponder, let alone act on planning, one's future. Jack's life is that, but he discovers inspiration along the way. I've seen Jeremiah in a number of plays and have always enjoyed his work, but especially so in this performance. When I saw that Carolyn Cook, whom I've seen perform on numerous occasions, was directing this play I knew then and there that it would be magnificent, and she doesn't disappoint. I'm a huge Carolyn Cook fan! I've known for years that she's a marvelous actress and now I know that she's a brilliant director, which I also heard from some of the cast. I can hardly wait to see what she does next! Kim (Cynthia D. Barker) plays an Immigration officer on an unforgiving, wholly determined hunt for a war criminal and she takes her job—and search for justice—serious! She gives us some laughs along the way, but is resolute in tracking down her murderous suspect. She also has a keen sense of style! 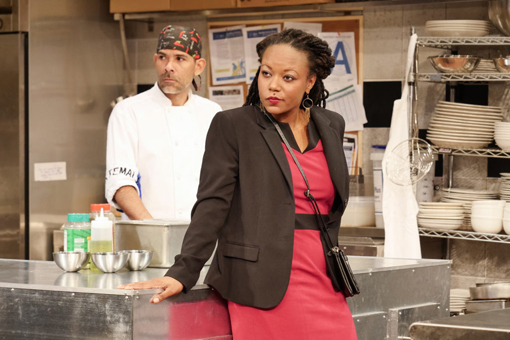 If "How to Use a Knife" is your first Will Snider-written play, I'm sure it won't be your last. I for one will be seeking out this multiple, prestigious award-winning playwright's work! This one-act play is 1 hour 45 minutes with no intermission, but you're so enraptured with the story and character's lives that you barely notice the passage of time. Be sure to arrive a little early to get your concessions...I recommend one of the big-as-your-head cookies! 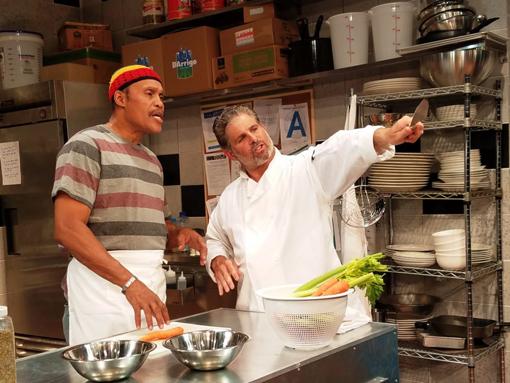 If just thinking about this play is making you hungry, enjoy one of these neighborhood restaurants before or after the show. El Bandido is a personal favorite. This restaurant is about to close! Make your reservations (get your tickets) and see "How to Use a Knife" at Horizon Theatre by this Sunday, June 25. NOTE: This play contains "spicy" language and is not intended for children. Equivalent to PG-14.